When Revealed: The first player chooses 1 character currently committed to a quest. Deal 2 damage to that character. Chieftain Ufthak get 2 Attack for each resource token on him. Forced: After Chieftain Ufthak attacks, place 1 resource token on him. 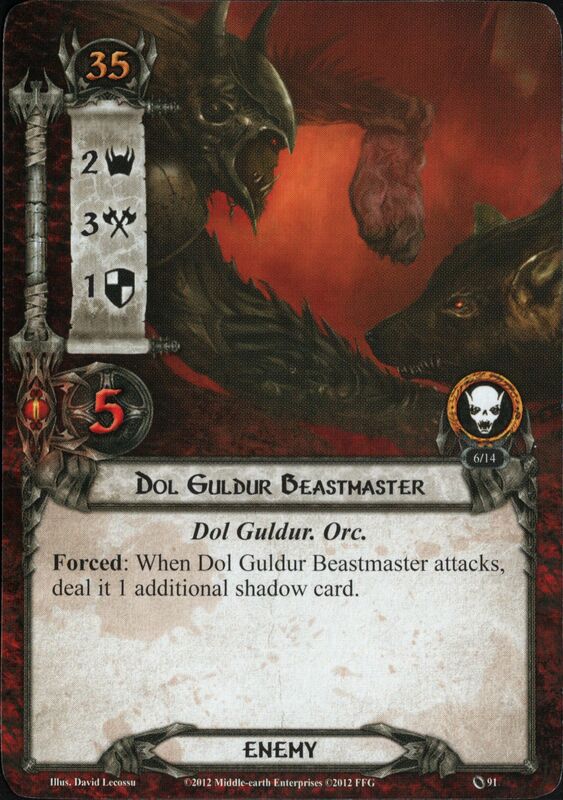 Forced: When Dol Guldur Beastmaster attacks, deal it 1 additional shadow card. When Revealed: Each enemy and each location currently in the staging area gets 1 Threat until the end of the phase. If there are no cards in the staging area, Driven by Shadow gains surge. When Revealed: Deal 1 damage to each exhausted character. Travel: The first player must discard 2 cards from his hand at random to travel here.